It is my pleasure to share my latest quilt pattern for Modern By the Yard, the free quarterly e-zine by Benartex. I was excited for a chance to work with Christa Watson's new Modern Marks line of fabric. I love the geometric designs on her prints and the bold, saturated color! My design super fast one-seam blocks. The placement of the blocks gives the quilt it's tossed design, like confetti! It coordinates so well with the ocean wall in my daughter's room. I chose one of my favorite prints, Half Ovals in Teal for my backing fabric. 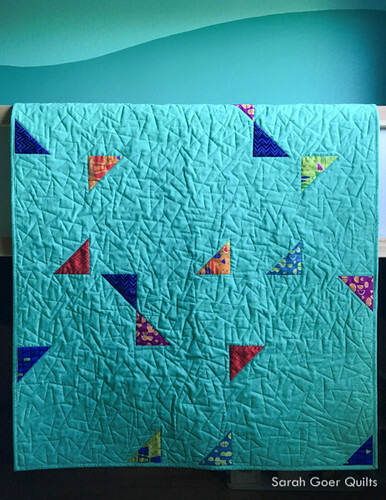 It is free motion quilted with a triangular meander motif using 50wt Aurifil. I'd love to see your project if you make this project or any of my other patterns. You can use #sarahgoerquilts on social media. I hope you enjoy this issue of Modern by the Yard. Head over the Sew in Love with Fabric for previews of all the projects in issue #7 and a link to the full issue which you can view online or download as a PDF. 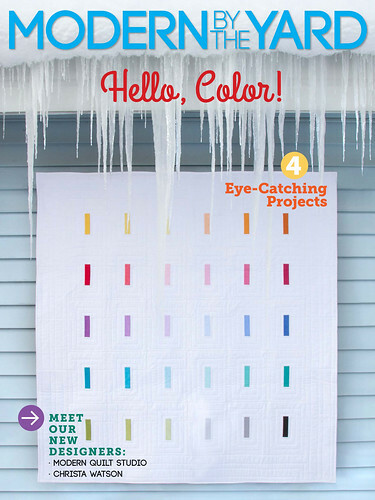 This beautiful cover quilt, Icicles, was designed by Chris at made by ChrissieD. I'm linking up to TGIFF, Needle & Thread Thursday, and Finish It Up Friday. Posted in Quilting. Tags: baby quilt, Confetti Marks, finished quilt, Modern Marks, quilt pattern on January 19, 2018 by sarah. 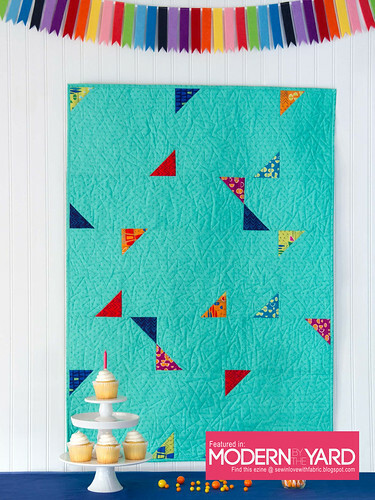 The quilt really coordinates beautifully with the teal in your daughter's room. Congratulations on the publication! This is so much fun! A happy burst of color in this dreary weather, for sure! Thank you, Alison! I love how they styled the picture! 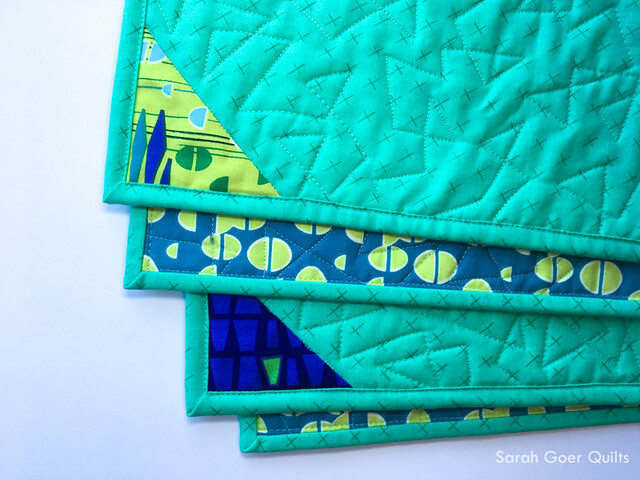 The "jagged little lines" quilting works perfectly here. (It's my favorite!) Very fun quilt! Enjoy! This issue is a great collection of colorful projects! Thanks for visiting, Izzy. Love this design, Sarah. I will HAVE to make it this year some time. I can’t believe how prolific you have been with all your new patterns in the last six months or so! Congratulations! Take care, Mary. Thank you so much, Mary! It's been a busy time. :-) I look forward to seeing your spin on this one. What fun! I love the bright background playing against the print triangles. Thanks, Cheryl. I had fun picking a blender from the line to be my background. This is a fun quilt. Love the background colour. I've downloaded the issue -- just need to make some time to read through. Enjoy! Lots of colorful eye candy this issue! Thanks for visiting, Anja. Thank you. I hope you've been able to download it now. I love all the quilts in that magazine, but the confetti pattern is my favorite!